tore and a publishing arm, but these little beastmen need to take baby steps. Little baby cloven-hoof steps. I've always been creating something, ever since discovering the RPG hobby way back in in the summer of 1984 at the age of almost-9. It is a disease of imaginative productivity I simply cannot shake. There is no cure. The only treatment is to get these ideas out for fellow gamers to consume. That is who I am; thus, that is what I do. Black Goat strives to create items that fit under the "grimdark" banner, with much of the early stuff being dark fantasy oriented. But fear not, I have extreme interests in most milieus and time periods of game-realms. Currently, BGG is focusing on supplementary material, like monsters offerings, sundries supplements, locale material, and adventures (as well as adventure seeds, hooks, etc). The hope is that Black Goat can expand a bit further, getting into new rules variations and such. I don't need much to get material out there into the gaming wilds to be hunted down and (hopefully) delightfully consumed, but every little bit helps. For more information and a few out-of-the-gate free goodies, please visit the website. Find Black Goat Games on Facebook here! And take a look at "Little Things: the first offering", if you're curious to see what BGG's first output was. You can pick up "The Murder Urchin" as Pay What You Want-- which can be free, if you so choose! If you ever have any questions, I am most happy to answer them! Your name on the Black Goat Games website as an humble acknowledgment (if you so wish). 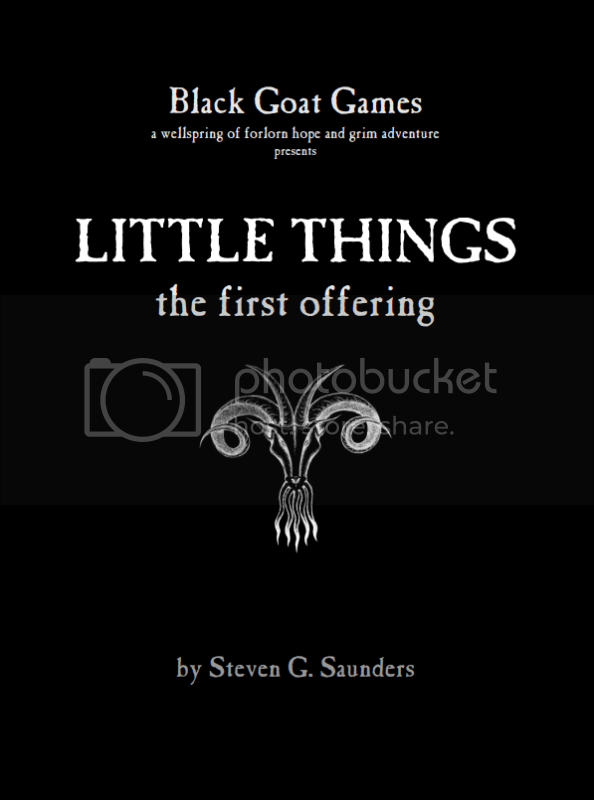 The first Black Goat pay-release, "Little Things: the first offering" (PDF). A freebie PDF compilation of the first run of freely offered BGG goodies. Some extra things will be added for sponsors only, of course! The Black Goat solemnly accepts your generosity! You get a thanks on the BGG website. 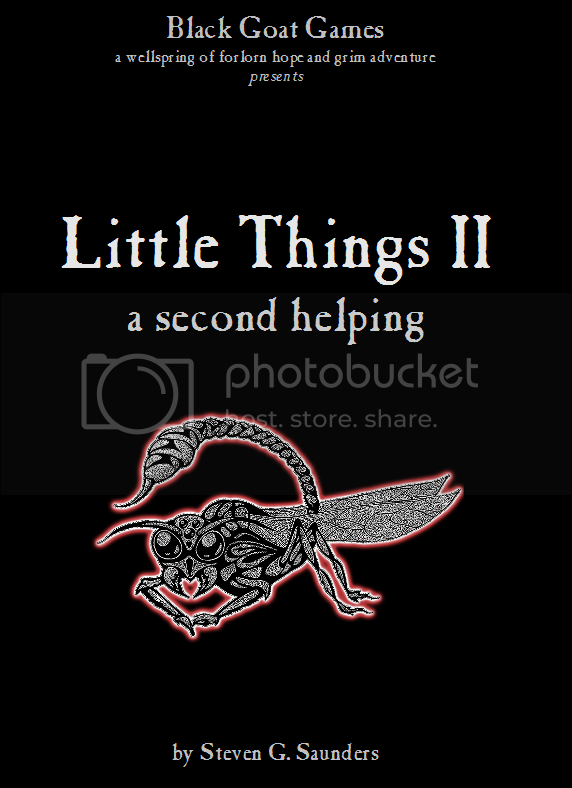 You get a PDF of "Little Things: the first offering". Your choice of the next Black Goat Games release that's retails for $5.99 or less! You can bank this and save it for later, natch. Keeping this pledge option open does roll you back into this reward again! You will receive a semi-regular PDF compilation of all the free materials from the site + new edits, and upcoming preview-and-play goodies. Extra treats will be added just for sponsors! You are kind in your dark offering! FOUR is a most powerful number. Thanks on the Black Goat Games website. SO MUCH THANKS! Personal thanks in the next available BGG release! The semi-regular freebie-compilation given only to sponsors! Plus, I'll probably include you in some way! A PDF of "Little Things: the first offering", as well as your choice of two other BGG products ($5.99 or less). Yes, you can bank these for later. This does roll into the next month/release if you keep the pledge going. Note: This will change after a while, but for right now this is a good time to jump on with this pledge and I make sure you retain the same status always within the dark heart of ye Black Goat. I will name a village that will appear in a BGG product after you (or the name you want). I'll also be open to ideas for naming/etc of items, people, plots, and whatever in order to properly honor you. The dark gods are mighty pleased with you, mortal. The monthly freebie-compilation given only to sponsors! I'll totally add you or something about you to it, as well. Personal thanks in the next available Black Goat Games release! Everything released before and during the time you sponsor Black Goat Games. Yes, everything. This should cover any release at the time, but if BGG releases something "super-expensive" (more than $10.99 retail) for some reason, I may then add a (very fair) caveat. When and if physical releases available directly through Black Goat Games are added, this option will have to be modified somewhat; but early continuous sponsors will get the additional reward of being grandfathers in, so to speak. The Goat loathes neglecting those who have been so kind as to help! This is indeed the best pledge level and I will take extra time to cater to you. Especially if you're an ongoing $6.66-er. The opportunity to get your eyes on BGG releases before they are officially released. I'll bother you as much as you like! Stalk me to help me stalk you-- eye-stalks, even! I will create a person or creature for you! You get to name them, come up with some details, and have final say on the sucker. Of course, this bit is subject to things/details/requests within reason. Seriously! Or maybe you want a land named after you or one of your offspring? Done! Get creative with me and I'll get creative with you. A village or town named for you or by you, with one unique feature you get to decide! There is always a need for more art. Always. Whether it be stock art, public domain bits, or commissioned pieces, art is one of the primary ingredients of the RPG imagination engine. With even a meager bit of wealth, I can instantly improve Black Goat's output and polish.